As for TX666 you could add some flying walruses running into the plane after you progressed far enough? I'm curious, anyone saw TX666's ending ? I'll see if I can try it later tonight or this weekend. As for your question, you should make a separate topic called Ndless development or Nspire C++ questions, so people see it more. Some members only visits help topics. Mednafen is a C++ mess, what the hell is wrong with those namespaces ? Anyways, i solved my issue but i think i'm stuck : Mednafen requires Threads. And i can't use pthread because you know... it is not available. Vogtinator said he planned on working on this but for now, i'm stuck. Gotta try another emulator i guess. Sorry to hear about that stuff D:, I hope this doesn't compromise your future projects. I'm still active but i'm mainly working on gcw0 for now, not nspire. i'll be back with new projects don't worry. Enjoy the ending, hahahaha ! Ooh I see. Will you post about gcw in the future? i'm back porting games again. 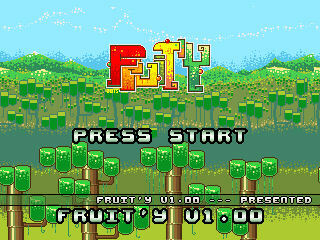 RetroGuru has recently announced that Fruit'Y, their latest game, is available for Dreamcast as a physical copy. 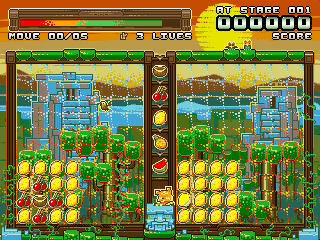 I have ported the game to TI Nspire, it will be made available shortly in a few days by retroguru themselves. Wait... a calculator can run a Dreamcast game? O.OO How is the game speed? Glad to see a new port from you by the way. Otherwise, it's a pretty good game and might become a must on nspire. It's definitively a refreshing change from the Sqrxz series. I'll definitively have to try it, assuming it works on my semi-broken Nspire. >.< Otherwise I could check how to get it on my DC since I got the game console. When will the ndless 4.0 come out already I've been waiting over a month(yeah I know its been in development for like half a year now), but I needs it nowsees, to play all these epic nspire games, and not just lua games(some of which are acutally good I have to say). My cemetech username is awesommee333. Ndless 4.0 will be ready when it will be ready. It takes time for the dev team to find exploits in order to get it to bypass the many anti-ASM/C protections that TI adds to each OS. Once such exploit is found, the team then needs to make Ndless stable. IIRC, most development is done behind the scene so that it doesn't fall under TI's hands. And when Ndless 4.0 comes out, it will most likely be followed by a new OS that blocks it again. Hence why Ndless releases for a specific OS are always several months behind. This is the same thing in the console or iOS jailbreaking community. It should work if my ports of sqrxz games work on it. probably the cheapest homebrew release on a physical format for Dreamcast.